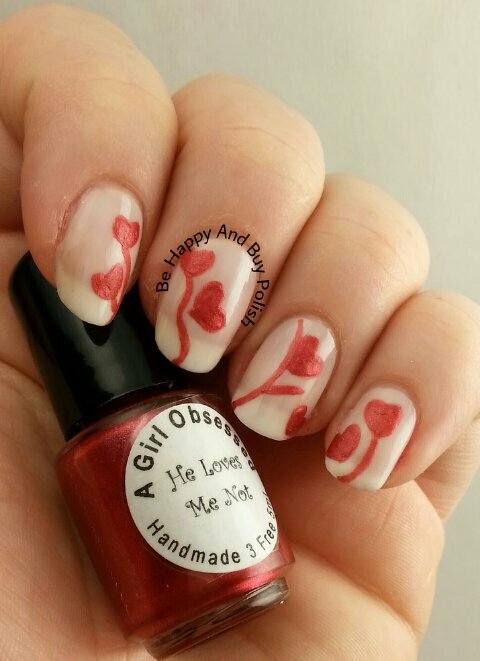 Posted in challenge, Manicures, Nail Art, pictures, Press Sample, Week of Love Challenge	by Jessica W.
Good morning! I hope you are all having a wonderful week so far. 🙂 Today’s challenge nails will feature a new-to-me polish from ellagee, Milk Glass. Milk Glass is a “jelly” polish meant to be sheer and layer with other polishes and glitters. This is 3 thin coats. I had no problems with application, but sheer polishes can be a bit fussy to deal with, so make sure you let each coat dry properly. On the upside, ellagee’s glass line dries pretty fast! You are so right. Sometimes simple is the best way to go. Amen! Love the simple sometimes. Yay! So glad someone got it! Sweet and simple definitely gets it down for me, sometimes. 🙂 I love this look muchly. Thanks so much Erika! It just hits the spot! Awh, I like what you created here 🙂 ! Great hearts! I’m sorry I missed out on this awesome challenge! Your nail art is lookin’ fab, lady! !